The world is an uncertain place, constantly changing and often chaotic. While many companies are unable to survive in this chaos, some companies are not only able to survive in these shifting conditions but even thrive in them. Great by Choice analyses why these companies succeed while most others fail. 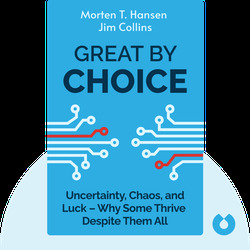 Great By Choice is the result of exhaustive, in-depth research into the business environment. 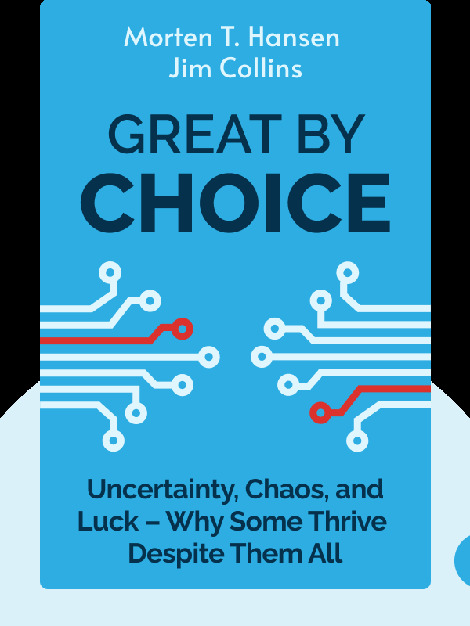 It argues that success is not the result of a company being more innovative, bold or open to taking risks, nor is it a result of mere luck or chance. Success in fact comes from a mixture of discipline, evidence-based innovation and a fear of failure that borders on paranoia. It is this recipe, rather than luck, which enables certain companies to become great. Jim Collins is a business consultant and author of many bestsellers including Good to Great and Built to Last. His books have sold over ten millions copies worldwide. He now operates a management laboratory where he conducts research and teaches. Morten T. Hansen is a management professor at the University of California. He is the author of Collaboration: How Leaders Avoid the Traps, Build Common Ground and Reap Big Results. He consults and gives talks for companies across the globe.